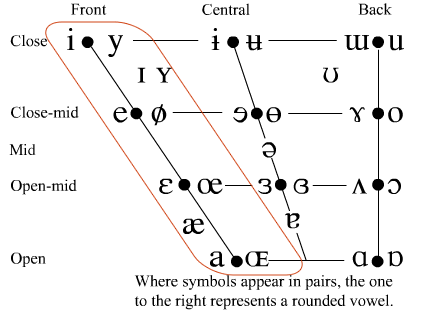 In the first part of this step, we made central vowel sounds that were between places familiar to the mouths of GenAm speakers. Today, we’re going to work on a lot of sounds that can be thought of as variations on vowel sounds that English speakers may (or may not) have in their own repertoire of vowels. This should be a playful exploration, so let’s try to have fun as we whizz through these new sounds! This post will feature lots of vowel charts from the IPA, so it may be a bit longer post than usual, because of all the images. 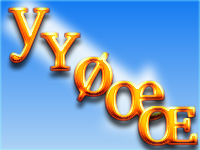 So far we’ve done the Close vowels: [i y] [ɨ ʉ] [ɯ u]. Each of these pairs of sounds begins with a sound that should be familiar to most native English speakers. By referring to a Lexical Set, we should be able to get at least in the ball park of the standard sound for these vowels. Here’s how to experiment with each of these sounds. Start by making the first vowel in the pair, for example kit‘s [ɪ] vowel. Keeping your tongue shaped as it is for that vowel, round your lips forward into the sound pair, [ʏ]. Now try saying some kit words with the new vowel: "ship, rid, dim." This should sound like your saying those words with your lips stuck in a "kiss-like" position. Next, try saying those words without their final consonants, trying to focus on the non-English vowel at the end. Finally, drop the initial consonant off the front, and say the new non-English vowel on your own. You’ll notice that the [æ] vowel doesn’t have a non-English pair. That’s because the International Phonetic Association says that there is no language in the world that uses a rounded equivalent. (That doesn’t mean that you can’t try to make a rounded version of it, though!) Apparently, the [æ] vowel itself is quite rare in the world’s languages, too. On another note, I found the rounded open front vowel [ɶ] to be quite hard to make — and perhaps so do others: it’s a very rare sound in the world’s languages, appearing in some obscure dialects of Swiss German. To wrap up the rounded front vowels, try going through all 5 of them (including the [y] sound we’ve already worked on, by anchoring your lips in a rounded position with the first sound and then gradually opening your mouth. It can help to "think" the English vowels you know as you’re making them: [y ʏ ø œ ɶ] while thinking fleece, kit, face, dress, price. I always find that this kind of exploration is much easier if you can keep the pitch the same through the exploration, so that you can hear the vowel change distinctly and not be distracted by the change in "note." Because this post is longer than I imagined, I am going to stop here for today. If we did all three areas (Front, Central, Back) of the vowel space, this would be a mamoth post. More on this in the next part!